1 What is the ADCON Wiki? 2 How to register? Lost your Password? Searching? 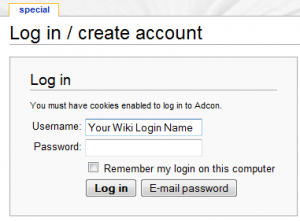 What is the ADCON Wiki? Welcome to the ADCON Wiki! - If you are looking for answers to specific problems, need general technical support, want to get some insider information on Adcon products, need a manual, or just want to browse the FAQ section, then this is the right place to go! As a registered user you can subscribe to our update service - and you will automatically be informed about any changes, news or updates made to your favourite topics! You will automatically receive our newsletter, bringing to you product information, success stories, background details, and more. How to register? Lost your Password? Searching? Caution: Please do not upgrade your JAVA 8 to JAVA 9. JAVA 9 seems not to be backwards compatible with our products A850 GUI and RTU GUI.!! Caution: Check the APRO Server Health Panel, weekly. Make sure your backup is ok and verified!! Note: NEXT TRAINING WEBINAR: GPRS connection parameter - 2017-11-29 / 4pm TZ vienna. A comprehensive list with proper explanations can be found here. Emulation software for addVANTAGE 3.45 to allow local and radio communication via a serial or telnet interface. This interface was used for all communication between addVANTAGE and the A730SD receiver. It was also implemented into the A840 Telemetry Gateway for those who wanted to use it with addVANTAGE 3.45 rather than addVANTAGE Pro. It is no longer implemented in the new A850 Telemetry Gateway, and is no longer supported or developed. Remote Transmission Unit, such as A733, A723, A740. This term refers to both radio (UHF) and GSM/GPRS devices. Line of Sight. When manufacturers of radios talk about transmission distances, they always refer to unobstructed Line of Sight transmissions. The distances that can actually be achieved vary greatly, depending on lots of circumstances, such as the installation height of the RTU and the receiver, obstacles between the two (trees, mountains, power lines, buildings, ...), atmospheric conditions and others. So please don't take LoS transmission distance for granted for your specific installation! Sensor Supply Time, this is the time a sensor requires to provide a stable output. For most Adcon sensors this is typically 2 seconds or less. Our support team will verify your data and within a few hours you will receive a system email containing your login details. Please check the Example below. * enter your login name and choose E-mail password. This page was last modified on 29 August 2018, at 09:53.